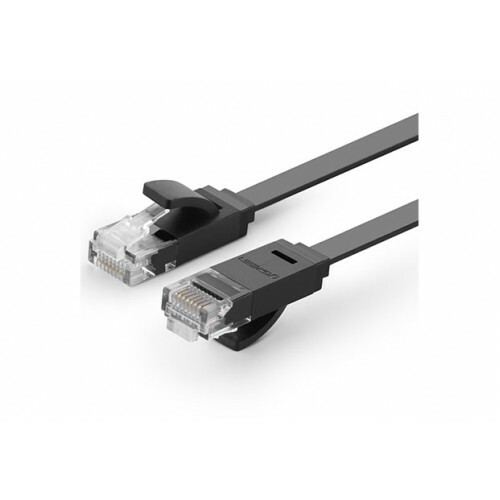 Ugreen cat 6 UTP Flat Network Cable 1M cable standard for Gigabit Ethernet and other network protocols. This cable has CAT6 type cable, Bare Copper Cable Conductor Material, PVC Cable Jacket Material and 32 AWG OD1.4*6.0mm Cable Gauge. The Cable Shielding: of this cable is UTP (Unshielded Twisted Pairs). It provides performance of up to 500 MHz and is suitable for 10BASE-T, 100BASE-TX (Fast Ethernet), 1000BASE-T / 1000BASE-TX (Gigabit Ethernet) and 10GBASE-T (10-Gigabit Ethernet). And it’s designed for use on Ethernet / RJ45 networks. And Suitable for connecting your PC, Xbox, PS3, Laptop to your broadband router.